Posted on October 15, 2015	by Katy K.
Diane Stanley’s The Silver Bowl was the first book I ever nominated for a Cybils award, back in 2011. And on that subject – today is the last day to nominate books for the Cybils, and if you were looking for a book to nominate in the Elementary/Middle Grade Speculative Fiction category, this one is eligible and has not yet been nominated. 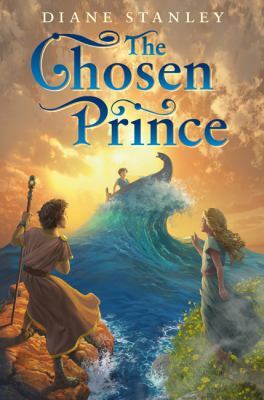 The Chosen Prince by Diane Stanley. HarperCollins Children’s, 2015. The publisher’s description of this says it’s “based loosely on the Tempest”, but the dealings with the Greek gods here are a bigger draw, at least for the kids I know. The kingdom of Arcoferra was long ago found guilty of crimes against Zeus, who punished it by splitting it into the kingdoms of Arcos and Ferra, doomed to eternal war against each other. With so many resources going towards the war, both countries face drought, famine, and the debilitating summer sickness. All the people believe, though, that Athene in her mercy will one day send a champion who will end the war. Prince Alexos, at his first visit to the temple of Athene, is determined to be the Chosen One. His father raises him harshly, determined to make him into the perfect prince. Alexos’s only comfort is he sweet baby brother, Teo. But when Alexos himself comes down with the summer sickness, everything he cares about is gone. Two things keep him going – the wise palace doctor, Suliman, who encourages him not to give up on life, and his visions of a magical island where the fruit trees bend down to give their fruit and the beautiful girl who lives there with her father. This has enough introspection to keep me and other character-oriented readers happy, with thoughts on survivor’s guilt and what it means to be a good person and a ruler. But with races, deadly illness, battles, shipwrecks, and political intrigue, there is also plenty to appeal to the action-oriented. While I was able to predict some of the plot, other parts were pleasantly twisty and surprising. This is a great choice for fantasy fans young and old, and especially great for kids turned on to Greek mythology by the Percy Jackson books. On that note, here’s a list I put together of Rick Riordan read alikes. This entry was posted in Books and tagged ancient Greece, historical fantasy, youth fantasy. Bookmark the permalink.